Hello everyone, and welcome to the first proper post in my World of Darkness Library series. In this article I am going to be discussing Vampire: the Masquerade 20th Anniversary Edition, about what you will find within the covers, and talking about the game itself – and why it tends to be my goto game for roleplay. This post does contain affiliate links. Vampire the Masquerade wasn’t my first foray into roleplay, that honour belongs to Shadowrun (I played the Troll version of Boba Fett, with spells), however it was the first one that really pulled me in. I played others and enjoyed them, and always heard about Vampire (In fact I found it annoying how the Vampire players tended to be obsessed with the game to the point of ignoring non players) but until my late teens, I had never played it. Vampire the Masquerade is designed as a player versus the world game of macabre politics, supernatural horror and questions about humanity and morality. Some of that seems fairly obvious given that you play a creature, damned in the eyes of God, that must subsist on the blood of the living to survive. In some respects, if that is all the game was about, then technically it is almost more humane than a human eating a burger. But, of course, it is not quite so simple as that. In Vampire the Masquerade, the driving force of your existence is your beast. An entity that resides within you that animates you and allows you to wield the powers of the blood; the disciplines that allow superhuman feats of strength, shapeshifting or even mind control. However, the beast is no mere passenger within a corpse shell. The Beast needs to feed, it wants to glut on blood. And it wants to kill. This is represented within the game by the Frenzy Mechanic. In game terms, you could be playing the most mild mannered post-human in the world, that wouldn’t hurt a fly. However, when frenzy overtakes you, you beccome a monster that kills and rampages and doesn’t slow down until dead or fed. And part of the horror of the game is players awaking from frenzy and having to deal with the consequences of their existence. And that is all before adding other Vampires and supernaturals into the mix. Vampire the Masquerade is a social, politics type game. Vampires are drawn together into feudal style courts, ruled by Princes, Barons or Bishops depending on the Sect your city belongs to. Princes rule Camarilla cities in a fashion similar to medieval feudalism enforcing brutal laws designed to keep vampires hidden, and designed to keep the young powerless and the old in power. Sounds familiar, right? Bishops rule Sabbat cities, their hierarchy based on the Catholic Church. The ethos of the Sabbat being an emphasis on power and freedom, and also fear of the return of the third Generation of Vampires. And Barons rule Anarchs, which (and forgive me, I am less well versed in Anarch Politics in vampire) tend to be in or near Camarilla domains, and are made up of the disenfranchised that do not hold with the oppressive nature of many princes or the stuffiness of the Camarilla. I am aware it is more complex than that, but it will do for the moment. Games of Vampire can be similar to other roleplay games where players have a task to achieve, such as breaking into some place to steal information, or to assassinate their patron’s rival or whatever. However, the games can also be political. One of the things with Vampires, there are a lot of old ones and they get bored easily so they love playing politics with each other, and trapping new arrivals in their games. In a game I am running now, the most antisocial member of the player characters needed a favour from an Elder, and in return she asked that he come to one of her salons and entertain her clan. He and I both know that is going to be an hour or so of torture for his character as Elder Vampires enage in insulting from playground level to statesman level. If he entertains them and doesn’t make a fool of himself, maybe the elder will give him a bit of patronage. If he screws it up, he’ll be a laughingstock for a while. That is the nature of politics and that is part of the game, as player characters are rarely the most powerful creature present. However, in situations like that the advantage of their advancing age is diminished ( a tiny bit) as it is considered bad form to mind control someone into a social faux pas. I like the game as it encourages players to ask the question, what would you do if you had eternity? And will you attempt to retain your humanity, or give in to your monster? 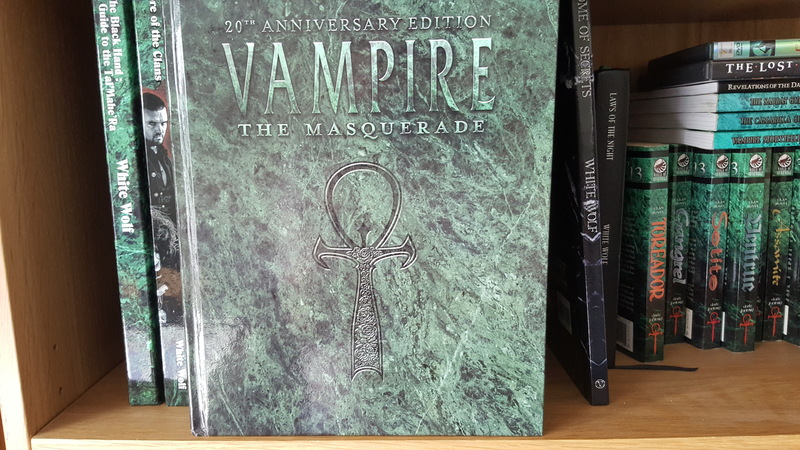 Vampire: The Masquerade 20th Anniversary Edition is a whopping 500+ pages of everything you need to know about the game, how to play it and how to run it. It details what it means to be a Vampire, in this context, and has an overview of the various sects in considerably more detail than I did earlier, whilst also giving a run down on the main 13 Clans, and a few of the rarer Bloodlines of Vampires. There is a clan or bloodline for virtually all playstyles. Want to be an undead Captain of Industry and Finance? Try Ventrue. What about blood magic? Tremere for you. And what about the monsters in the dark that know all the secrets? That would be the Nosferatu. There is a very detailed section on charater creation, including all the abilities you can learn and all the other background stuff your character might have. And there are pages and pages of vampiric disciplines. All the classics from Hammer Horror are covered, from mesmerism, forgetfulness, summoning of people, summoning of beasts and super strength and Speed and so on and so on. You can have a lot of fun just reading all the various things that vampires can do if they spend the time developing their blood fuelled powers. You will also find many rules for combat, including weapons and maneuvers, rules for various states such as drugs, poison and disease, and even extremes of temperature. And of course there are some templates for enemies that you can use in any of your games, such ars rampaging werewolves, fickle changelings or mysterious mages. Of course, if you are a purist like me, you don’t use the Werewolf, Changeling and Mage templates because they each are a game unto themselves and it is more fun building full characters rather than using the templates which only have equivalent abilities which are nowhere near as fun. I bought the hardback version of this book, a couple of years back and despite frequent use it is still in very good condition. A testament to the quality of the binding. The paper quality is also of high standard, which you can tell just by running your fingers over it, particularly on the artwork pages. It is perhaps less suited for someone who wants their roleplay experience to be more adventure/fantasy and less thriller/horror. Either way, the Vampire series of games are still my favourite and likely to remain so forever. The Quest for the Perfect Game Chapter 6: Epilogue – Get Involved! If I could find a group of people to play this, I would totally give it a try! Sadly, most people around where I live only play D&D. I have asked them to give it a try and they seem open to the idea, but they’re pretty set on D&D, Axis and Allies, Risk, and Lord of Waterdeep right now.